Mount Satopanth is located in Garhwal Himalaya region of Uttarakhand and gets esteemed position among the avid trekkers for technically moderate trail and a complex glacial approach. Mt. 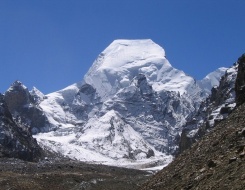 Satopanth is claimed to be the second highest summit in Gangotri Group and it is found in the remote India Garhwal Himalaya Range. Moderated winding paths passing over the knife sharp edges lead to an incredibly beautiful and remote area where you will be blessed with the close views of Bhagirathi II or Gangotri Glacier. The jaw dropping views of Thalay Sagar, Shivling and the terrifying granite pillars of Bhagirathi III are the delights of this trekking expedition and let you see the views which you will love to cherish in later years. Your Base Camp at Vasuki Tal will let you stretch your arms on the cosy lap of Nature Goddess while your further walk to the next Base Camp will be challenging and will give you exact amount of adrenaline rush. Prior to the summit bid we will camp at three more sites and spending around three weeks of time we will be back to the home carrying irreplaceable trekking memories. On arrival at Delhi meet our representative and transfer to pre booked hotel. Overnight at hotel. Today morning after breakfast visit Indian Mountaineering Foundation (IMF) for briefing and to complete all formalities. Once you are done drive to Rishikesh via Haridwar. Enroute get down at Haridwar to explore Har-ki-Pauri Ghat & temples. Keep driving to Rishikesh. Once you arrive in Rishikesh check into hotel. In the afternoon you will be taken out for sightseeing tour of Rishikesh. Explore the Ashrams and temples. In the evening enjoy Ganga Aarti. Overnight stay in the Hotel. This morning after breakfast drive to Uttarkashi. On arrival check into hotel. Rest of the day you are free. Overnight stay at Resort. Today you need to meet all formalities with Local Administration & Forest Department. Overnight stay in the Resort. Post breakfast drive to Gangotri (3048 mt). It is believed that Ganga first descended to earth at Gangotri. On arrival check in to hotel. The day is free for acclimatizing. Spend the evening exploring the temple and surrounding sights. According to your wish an optional Ganga Puja (offering) can be organised on River Ganga. Overnight stay at hotel. Today after breakfast trek to Bhojbasa (3769 mt). En-route we will cross Chirbasa (3600 Mt.) The trail passes through the river and a further walk let you have the first views of the Bhagirathi Peaks. The literal meaning of Chirbasa is the home of pine. Keep walking and here you reach Bhojbasa, home of birch. On arrival set-up camp. Overnight stay in the camp. Day 7 Bhojbasa - Gaumukh - Nandanvan (4337 M). Today we will trek to Nandanvan (4337 mt). The day will require a slightly longer walk, but rest assured you will be rewarded with superb scenery. The trail goes up the terminal moraine before crossing the Gangotri Glacier. The trek through the Gangotri Glacier and ablation valley is comparatively challenging yet exciting. Crossing the glacier we will climb steeply up to the huge ablation valley of Nandanvan. We will set-up our camp at Nandanvan for overnight stay. Our camp will be sat at Nandanvan on the left ablation valley of the Chaturangi (4-colour) Glacier which is located at the base of the Bhagirathi II peak. The day is free for acclimatization and for exploring the surrounding area. Today we will trek to the Base Camp of Vasuki Tal (4898 mt). We will trek along the ablation valley of the Chaturangi Glacier. Further our trek will let us walk past the Bhagirathi II and Satopanth along with Vasuki Parbat on our right. We will camp next to Vasuki Tal. It is a small breathtaking lake in the ablation valley. Due to high altitude this place will be lacking in availability of right proportion of what makes the day's trekking fairly demanding. On arrival setup the camp for overnight stay. The day is free for acclimatisation. We will spend another night at base camp. We can also go for a short walk from Vasuki Tal towards Advance Base Camp. Today we will walk on a narrow ridge with Chaturangi glacier on our left and Vasuki Parbat on the right. At the edge of the ridge, we can have a glimpse of the majestic Satopanth. Now we will descend to the Sundar glacier. After a long moraine walk we will reach the advance base camp. (5130 mt). Another day for acclimatization. We can go for a short height-gain and will come back to ABC for overnight stay. We will go for a technical climbing next day so ropes will be fixed today and we will come back to ABC for overnight stay. Our technical climbing session starts today. After a short walk on the glacier, we will negotiate a rock band and a bit later an ice gully. From here we cross a few gentle humps to arrive at camp 1 (5800 mt). We would use ropes for this part of our trekking session and ascenders as well. We are now completely on the lap of pristine nature. Wake up at leisure and starting the day we would go for a short walk to a certain height and come back to Camp 1 for overnight stay. Here we will go for a short steep walk and reach the infamous "knife ridge". Pre-fixed ropes will help us on this part as well. Progress will be slow on this section. Once we cross the ridge, we will be on the sharp icy face of the mountain. We will pitch our tent just above a hanging glacier. Today our motive is to attempt the peak and to coming back to Camp 2 for overnight stay. This morning after breakfast come back to Nandanvan. Once we reach we will setup the camp for overnight stay. Post breakfast trek back to Chirbasa (3600 mt) via Gaumukh and Bhojwassa. Once you reach Chirbasa, walk down from the main trail. We will set camp close to the river. Overnight stay at Chirbasa. Today after breakfast we will drive to Rishikesh via Tehri. On arrival check into hotel for overnight stay. Transfer to international airport according to your flight schedule.